2000 Update: This artist captured our attention this year with "Shawana". 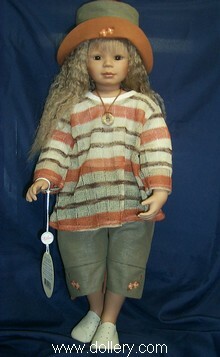 This small limited edition doll is currently sold out nationally to dealers. Bettina Feigenspan-Hirsch sculpts for Zapf and we were impressed with her work this year. She also has an adorable little boy Florian. Please feel free to inquire about any of her line. Email kmalone@dollery.com for further information!